Are smart cities too wacky, or are they really not that far away from reality? We runners often talk about technology by talking about how the shoes we wear, the energy gels we consume and the devices we carry have changed and/or improved our lives. Runners, with or without knowing it, are enmeshed in the internet of things, which can be thought of as a network of our devices. We log running data from our wearables, use our phones to turn off appliances or set the temperature in our house for post-run pleasure, and could soon be wearing clothing that uses biosensors to measure muscle performance. While we mainly think about technology in our gear, gadgets also revolutionize our running routes and spaces. While some of these innovations may seem like unbelievable science fiction, consider the rapid-fire evolution of running devices in even the past 10 years: Fitbit was founded in 2007, Nike+ FuelBand launched in 2012, and the release of Jawbone Up was in 2011. It may not be that long before what sound like far-fetched ideas become realities for the everyday runner. Enter ‘smart cities.’ What is a smart city? 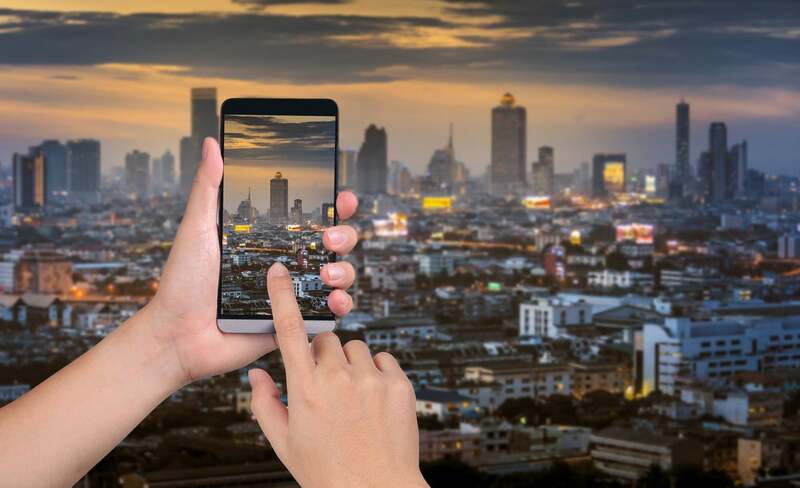 At the most basic level, smart cities bring the internet of things to the city level, using a combination of technology embedded in the infrastructure of a city and data collection methods to improve the lives of inhabitants. Smart cities are appearing across the globe, developed from the ground up like in Songdu, Korea, or adapted to a city like Madrid. They are not limited by city size or location; for example, Kansas City is set to become the largest smart city in North America. According to technology giant Cisco, these cities use a network of video surveillance, additional sensors and social media to enhance security. Smart city could eliminate bandit runners from racing—they would require wifi tags to enter and access routes—and could provide integrated real-time tracking and updating information. They could also increase runner safety and emergency response; Tulsa is already using data to create ambulance routes. Smart cities and technological advances will also change the nature of running surfaces. For example, we could be running on solar panel-based pavement, which can collect data on users and offer WiFi services. What if you prefer the natural terrain of a park to the hard pavement of the city? New park initiatives are developing creative solutions to restore green space in areas where this spaces has been claimed for building and transit. London’s Garden Bridge will be an open footbridge across the Thames River with pedestrian footballs, which will be free and open for most hours. But what if running above ground isn’t enough for you? Try running in an underground park! New York’s Lowline represents the next step in reclaiming urban spaces; it is a converted underground trolley terminal station lit with new solar collection technology. If successful, Lowline could inspire entirely new ways of thinking about and constructing alternative parks. So how will these developments impact the runners of the future? Imagine 2025. The alarm goes off, and I grab some water, chew on some cereal and get dressed with the familiarity of having done this for years. Before I head out, I set the functions on my devices and smartphone to the usual buffet of pace, distance, heart rate and elevation. It’s turning to winter, so I will want to collect some temperature and wind data. I’m going to consider this long run to be “me” time, disabling emails. But of course, I upload the route I will be taking, so that if anything happens while I am moving, I can get real-time notifications from the interfaces I will pass along the way, and if there are any emergency emails, people will reach me through the connected city network. As I leave the house and turn onto my first street, the street lamp notices my presence and illuminates to a dim morning light perfect for this area. As I run through town, the streetlights slowly fade off as the sun comes up. Luckily, to increase transportation options in town, the downtown area has been converted into a pedestrian only space. As I am waiting for a light to change on the periphery, I’m just too excited to get in this space, and I run through a Do Not Walk sign. I make it into the park, and the city notifies me it’s going to be dropping 10 degrees before I get home. My thermostat is networked into the city’s temperature data and will adjust itself without me even having to consider it. When I’m exiting the park, a smart display in a window flashes that I will be receiving a route change, as there has been an accident on the last part of my route. I am glad I will not have to re-route. My devices know when I have reached the house and have turned on my ice bath for me. I get in the ice bath, and follow it with a perfect shower at a temperature that the shower has learned is my favorite. When I emerge I am dismayed to find that, unlike the traffic cameras of 2015, there is no delay for my infraction at the cross-walk; I received an email with a court summons while I was still out on the run. After all, the name of the game is safety, and I have a responsibility to play my part. While this (outside of the ticket) may sound idyllic, remember that there are less positive sides to the technological capabilities of future cities, parks and devices. So what does that mean for you? Be smart and educate yourself on what you are using. Are there participatory engagement meetings in your town or for your favorite park? Try one out, try making your voice heard. Or, we could all just run our races in CV Dazzle to avoid face detection from the myriad surveillance methods of the smart city. Stephanie E. Vasko is an interdisciplinary researcher studying emerging technologies and the intersections between art/craft/design and STEM fields. You can find her on Twitter @stephanievasko or at www.stephanievasko.com. Which Is Better: Watching A Race From The Sofa Or Sidelines?